Today is Friday, January 6, the sixth day of 2017 in the Gregorian calendar, with 359 days remaining. 668 days until the 2018 midterm elections. 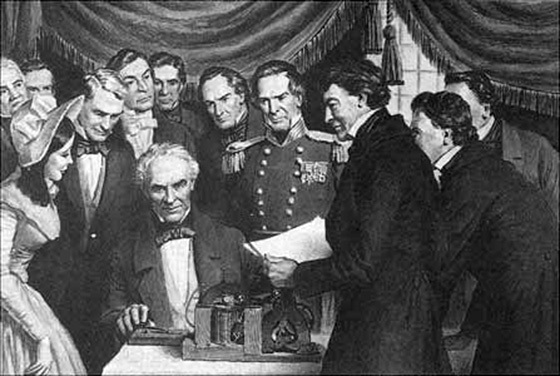 On this day in 1838, Samuel Morse demonstrated his new communications device, known as a telegraph, for the first time. The telegraph converted a simple code alphabet (known as Morse code) tapped out on a single key into electrical signals. These signals were then sent along a cable and decoded on the receiving end. Anywhere a cable could be laid- across mountains or under oceans- telegraphic messages could be sent. By 1852, the United States had 20 telegraph companies with 23,000 miles of wire. On Monday, July 12, 1999, a final telegram was sent from the National Liberty Ship Memorial, the SS Jeremiah O'Brien, in San Francisco Bay to President Bill Clinton in the White House. Officials of Globe Wireless reported that "The message was 95 words, and it took six or eight minutes to copy it." They then transmitted the message to the White House via e-mail. That event was also used to mark the final commercial U.S. ship-to-shore telegraph message transmitted from North America by Globe Wireless, a company founded in 1911. Sent from its wireless station at Half Moon Bay, California, the sign-off message was a repeat of Samuel F. B. Morse's message 155 years earlier, "What hath God wrought?" Among other things, today is also National Smith Day, commemorating the January 6, 1580, birthday of Captain John Smith, the English colonial leader who helped to settle Jamestown, Virginia in 1607. Depending upon which history source you consult, January 6 may also be the birthday of mountain man and explorer Jedediah Smith, who blazed trails across the West. Florida woman hits fiance with 2-by-4 over engagement ring. They don't say why. It's Florida; does it matter? As of this writing, The KGB Quotations Database contains 44,260 entries. Check it out. "A class of people is growing up who are unexploitable because they are not worth employing even for the minimum wage. Technological progress makes whole categories of people useless without making it possible to support them with the wealth produced by the progress." Secrets of the universe: The filling inside Kit-Kat candy bars is... Kit-Kat candy bars. Feedback loops between record Arctic temperatures and the jet stream may be altering our weather. The Arctic is getting crazy. Biographer uncovers evidence that Nixon was not merely a serial liar, but evil. His ploy to win cost literally thousands upon thousands of American and Vietnamese lives. Robots are becoming more physically adept and are improving emotional connections to humans. "We're on the cusp of a robotic moment." The National Institutes of Health says it could be possible to prevent the development of deadly peanut allergies by introducing peanuts to infants. "The... study clearly showed that introduction of peanut early in life significantly lowered the risk of developing peanut allergy by age 5. The magnitude of the benefit and the scientific strength of the study raised the need to operationalize these findings by developing clinical recommendations focused on peanut allergy prevention," said Daniel Rotrosen, M.D., director of NIAID's Division of Allergy, Immunology and Transplantation. Doctors: Seriously, Stop Sticking Q-Tips In Your Ears. And don't even try ear candling, an alternative medicine procedure that involves lighting a candle over your ear to try and draw the wax out. It doesn't make any sense and you'll probably just get candle wax in your ears. Due to a new law, the IRS must delay paying out refunds on returns that claim the earned-income tax credit or a child tax credit. Those returns are the most likely to contain identity-theft fraud, because criminals can claim refunds of $3,000 and up using those tax breaks and get the money before the real taxpayer even knows what happened. But they are also the returns of the low-income taxpayers who file their tax returns early in the year and rely heavily on those refunds to pay down debt, make big purchases or replenish savings. Refunds for these folks will be delayed until February 27. The IRS will begin accepting 2016 tax returns on January 23. This year's deadline—without allowed extensions—is April 18, not April 15, because of a weekend and the Emancipation Day holiday in Washington, D.C. The bad news? Conan may no longer have a daily talk show. The good news? Conan may no longer have a daily talk show. Have a good weekend... see you Monday.